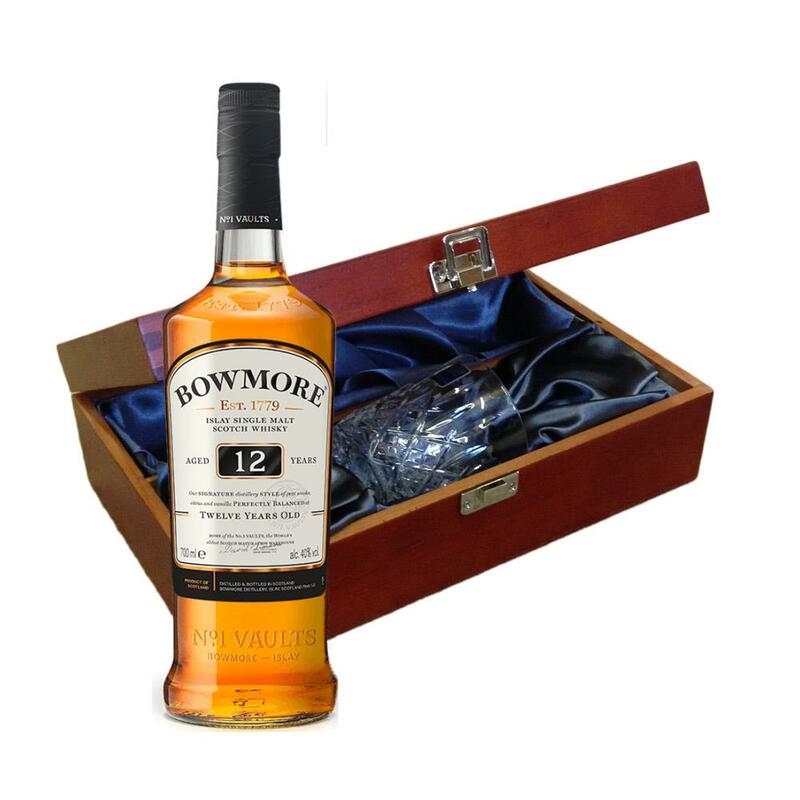 Send a bottle of Bowmore 12 Year Old Whisky 70cl wine in a lovely box beautifully stained featuring traditional joins with hinged lid and clasp fastening. Along with a beautiful hand cut lead crystal Royal Scot glass. All gifts come with a gift card with a message of your choice. Bowmore Legend Island Malt - The second oldest distillery in Scotland and the oldest on Islay Bowmore is one of the most prestigious in all of Scotland and producer of one of the worlds broadest and most distinctive ranges of Single Malt Scotch Whiskies. The heart of the Bowmore range the 12 year old exhibits some beautiful coastal notes with a gentle peat it is the balance that the floral element presents that makes this a great entry bottling for Bowmore. This product is hand packed onsite by Gifts International, and is not affiliated with any other brand. Gifts International is responsible for this product combination/set.